Sharks are a special type of fish that do not own any bones in their body, instead they own cartilaginous skeleton. The sharks are considered the kings of water as the lions are the kings of the jungles. There are about 440 species of sharks distributed in all the oceans and seas over the world. It has been confirmed that there is one species of shark that can swim in the fresh water of rivers, it is the bull shark. The shark have a very strong smell and hearing senses, which allow the shark to locate the preys easily. It can also detect the prey direction due to the vibrations of the water. Although the sight sense is not as strong the other senses, but the fact that the sharks eyes are in the sides of the shark’s head widen the range of sighting. Most species of female sharks give birth of 6 to 12 babies, but rare species of sharks lay eggs. The baby sharks called pup. 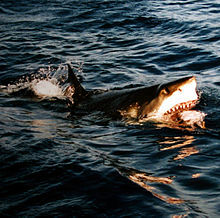 The female shark give birth of her pups after a period that range from 5 months to 24 months according to its species. Some female sharks can in some cases reproduce without a male. The sharks teeth are formed in several rows that range between 5 to 15 rows, this way the shark will always have some teeth, as the shark tooth do not have roots and it is changed every week. The shark skin is so strong that it reaches four times the cattle’s hide. Instead of scales as the other fishes, there are small and sharp plates all over the shark skin. The size of the sharks vary, as some species size is about 8 inches while other species would reach about 59 feet (the size of a school bus). They got 5 or 6 gills on each side, while the other types of fishes only have one gill. The shark gills are not covered as most of the fishes that have flaps covering their gills. The shark don’t sleep, they just stay quit for rest, most species have to keep moving in order to allow water into their gills for respiration. The sharks can swim fast with speed that range between twenty and forty miles an hour, while one species called mako shark can swim with a speed that can reach up to sixty miles per hour. Not all shark species attack humans, but only white sharks, tiger sharks and bull sharks which is the most shark attacker to humans. People killed by the lightning or bee sting are more than those killed by sharks. Sharks are hunted for the meat, skin and liver oil which is full of vitamin A. The Chinese shark fin soup, cause people to hunt the sharks, cut their fins and threw them again in water. The shark cartilage was used in searching for cure of cancer, as the shark does not get cancer, but the shark cartilage failed to get the tumors smaller.